Tomato Gravy – Take a pan and heat 1 tablespoon oil. Add onions and sauté it for 2-3 minutes. Add ginger, garlic, tomatoes and sauté it for 4-5 minutes. Let it cool and blend it. Soak cashew nuts for 30 minutes and blend it to make the paste. Take a pan and heat remaining oil. Fry paneer and keep it aside. In the same oil, add tomato gravy, salt, turmeric powder, red chilly powder, garam masala, 1 cup of water and let it boil. Add cashew nut paste and boil it for a minute. You can even use it fresh cream instead of cashew nuts paste. 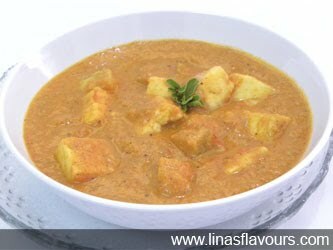 You can even prepare the gravy before hand and add paneer while serving. Before serving, heat the gravy, add paneer and mix it well. Garnish it with basil or coriander leaves and serve it with roti/paratha.